The story about the actual discovery would be too long for this website, so I present only some conclusions here. In short, I made the discovery in May 2006 during research concerning the inaccuracy of the Rule of Thirds: I needed to know why the Rule of Thirds did not "work" (I found this out earlier). Completely unexpected I found another composition method, which I called the "Diagonal Method". After years of studying the Diagonal Method, I concluded that the Rule of Thirds does not work because it is a theory (just like the theory of the Golden Section). Some people believe in these theories, but they remain theories, or in other words: they were not discovered in existing paintings or photographs. The Diagonal Method is accidently discovered in actual works of art while not looking for confirmation of any theory, and is, by this definition, not a theory. Only when one presents this discovery to the world, it becomes a "theory". In the following section I explain some of the phases of the discovery. The 35 mm photographic frame is a rectangle with a ratio of 2:3. 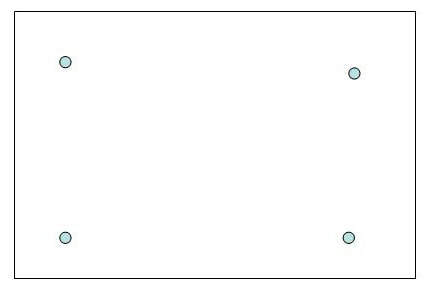 Within this rectangle you can draw two squares that overlap each other (see fig. 1). I discovered that artists like Rembrandt, famous photographers, but also amateur photographers, often were placing details like eyes exactly on these Diagonals. To test this I used a transparency with just one bisection line (see fig. 2). Because of the exactness of the DM it is necessary to align the corner of this sheet exactly with the four corners of the work of art that you want to test. It is not possible to see whether a detail lies on a Diagonal, without using such a sheet (but you can see the Diagonal lines using the crop tool in Adobe Lightroom or Photoshop CS/CC). Any position on the four diagonals could have been used to place details by the artist. Details are often lying on the Diagonals with a accuracy of 0 to 1 milimetre on a A4 size picture. Precisely this accuracy was the decisive factor in my research. If the Diagonal Method would have been just as inaccurate as the Rule of Thirds, then I just would have thrown all my findings in the dust bin. The dots in fig. 3 can be possible locations of important details in a picture. After testing hundreds of paintings, drawings and photographs by famous artists and also amateurs, I saw that in relevant cases, - meaning in portraits and people pictures -, important details could be found exactly on the bisection lines (called by me "Diagonal Lines"). I drew (with the computer in Word) five rectangles with an exact 2:3 ratio (as is used in 35 mm photography) on 5 sheets of A4 paper. The reason for this was that, if the Rule of Thirds does not work, what would happen if I would place four dots in a rectangle, comparable with the four cross points of the Rule of Thirds, in an absolutely non-rational way, just by feeling or intuition? I did this on the 5 sheets of paper, so I got 5 rectagles with 4 dots in each rectangle (fig. 1), somewhere in the four corners. I looked at these and I saw that the dots in the upper left corner were lying more or less on the same position, in all the five rectangles. I did not know what to do next. Thinking of the use of circles by Rudolf Arnheim, I made a circle on a transparancy and placed the centre of the circle on the dot in the upper left corner. To my surprise I saw that this dot was lying as far from the upper frame line as from the left frame line (fig. 2). Directly hereafter I tested a photograph made by a student (see the photo above), and was shocked to see that, - when placing the circle so that it would fit exactly in the corner - , the centre of the circle was exactly on the left eye of the girl (the right eye for the viewer).Then I tested dozens of famous paintings and famous photographs and was again shocked to see that very important details, concerning the content of the art works, were on the centre of the circle. I called this then "The Circle Method." 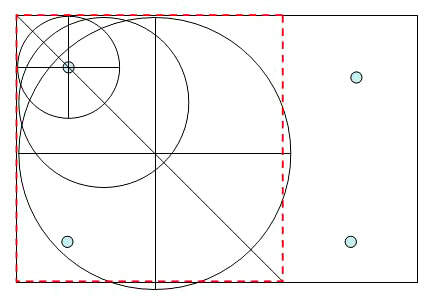 ​During the writing of a chapter about this discovery in my new book about composition for my classes, I continued with my research and discovered that the centre of the circle was at the same time lying on the bisection line of each corner of the rectangle (or the frame of a photograph) (fig. 3). This meant that the bisection lines were at the same time the (mathematical) diagonals of the two overlapping squares in the rectangle (fig. 4). So I changed the name in "The Diagonal Method". Actually I did not know then that this dividing line was called the "bisection line". A student of mine said this to me. This would mean that I could rename the discovery again and call it "The Bisection Method". But by then Adobe had already implemented my discovery in Lightroom version 1.1., naming it "Diagonal", so I could not rename it again. So it will always be called "The Diagonal Method".